Soggy food and wet hands are known hazards of digging into a cooler. But with a cooler divider in place, food and drinks stay nice and dry. The Cooler Tray diverts melting ice away from your food and drinks, thanks to a grooved design that lets it drain into the bottom. The tray, adjustable to fit most coolers, stands on legs and holds up to 80 pounds of ice, food, and drinks. Everything stays icy cold, but with less residual wetness. Bryan Kendrick came up with this Why-Didn’t-I-Think-Of-That creation. 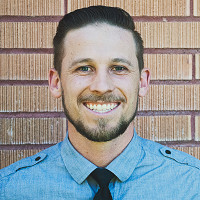 He got tired of water logged food in his cooler—and was particularly grossed out once when packs of uncooked meat got wet and leaked all over everything else. Bryan’s tray prevents picnic staples from floating in a small sea of former ice. It makes camping, cookouts, and days at the beach that much better. Hey Grommet Fans! My name is Bryan Kendrick founder and inventor of The Cooler Tray! Today I have the privilege of introducing to you a brand new product, that solves a problem we have all experienced. 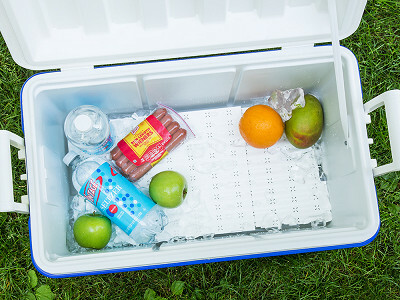 The Cooler Tray will save you time, money, and stress—giving you a better outdoor experience. I'm hear to answer your questions and explain why you'll want this product on your next family outing! Love the idea. Would you pls post the dimensions (normal and extended)? Unextended: 15" x 10.5" x 2.15"; Extended: 27" x 11.5" x 2.15"
@Bryan It's too bad the legs are not adjustable as well. It seems as though your food will still be floating in water when the ice melts and leaves over two inches of water at the bottom of the cooler. Hi R.J., by the time you have two inches of water you may have bigger problems than your food floating in water. The cooler tray helps keep the ice from melting faster giving you more time. @R.J. - @Jim and @R.J. - The Cooler Tray™ will hold 15 -20 lbs of ice under the tray without you having to worry about it. Its' a lot of ice to fit in a cooler with your food and drinks, if you are putting more than a 20lbs bag in your cooler, your don't have enough food :) for your outing haha. It will keep your ice up too 24 hours longer than normal because it's not sitting in water, so you won't have as much water in the bottom of your cooler as you used too, because it is melting much slower. Also the height of the legs ideal so you can fit a full gallon of milk or other food carton inside standing up straight. If your legs were taller, it would give you some more space for ice melt to go but then you sacrifice more crucial space inside your cooler. We've found that this is the ideal height to compensate maximum space in your cooler and maximum space for ice melt. Just ordered 2. Graduation party for 70 this weekend and 86 degrees forecasted. I'll let you know how it goes. Good luck Bryan! That's a great test, David. Let us know! @david That's awesome David, your going to love it!! Similar to R.J.'s comment, how much ice will be too much to breach the top of the tray? There of course will be a limit to how much water can be contained below the tray. If your cooler has a drain plug, that will work but if not? Additional extender feet could be an option. @Jim and @R.J. - The Cooler Tray™ will hold 15 -20 lbs of ice under the tray without you having to worry about it. Its' a lot of ice to fit in a cooler with your food and drinks, if you are putting more than a 20lbs bag in your cooler, your don't have enough food :) for your outing haha. It will keep your ice up too 24 hours longer than normal because it's not sitting in water, so you won't have as much water in the bottom of your cooler as you used too, because it is melting much slower. @Debbie - It is kinda hard to understand the first time but its really simple.... they're two trays that lay on each other and can slide apart to extend in length. To extend the tray with more width we have supplied each Cooler Tray™ with two side rail extensions in each bag. These you simply snap onto each tray accordingly adding on an inch of width; for coolers that are normally in the range of 70qt-110qt in size. I like the concept and it seems to be the ideal solution to a universal problem! I am wondering...I'm going to try using dry ice in the bottom of my cooler next trip out. Do you think the supports will melt into the block of dry ice? @Bill I've crushed up a block of dry ice into several chunks and put it under the tray base, for my meat, and it worked just fine. Didn't have any of the legs melt into the ice. It works as a great separator! Love the concept, but having a little issue with how you start off. Do you put the tray in on top of your ice, then your food and drinks, or ice and drinks in first, then tray and food, etc. Just trying to get it right! Hi Carol, great question. In order it goes: tray, food/drink, then ice. @Carol - it basically becomes the new base of your cooler.... you put it in there and then place everything else on top, and as the ice melts it will drain down through the tray and keep your food safe. your picture shows a head? of lettuce on the tray and then you put ice directly over the top of your food? Wouldn't the ice completely ruin the lettuce and tomato? Hi Laurie, we didn't put ice on the lettuce over the tomato and lettuce for the exact reason. But The Cooler Tray will help keep your cooler colder for longer to preserve them. Soggy food and wet hands are known hazards of digging into a cooler. 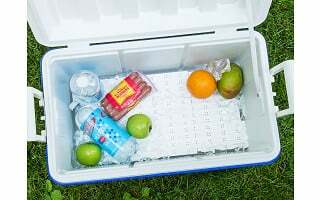 But with a cooler divider in place, food and drinks stay nice and dry. The Cooler Tray diverts melting ice away from your food and drinks, thanks to a grooved design that lets it drain into the bottom. The tray, adjustable to fit most coolers, stands on legs and holds up to 80 pounds of ice, food, and drinks. Everything stays icy cold, but with less residual wetness. Bryan Kendrick came up with this Why-Didn’t-I-Think-Of-That creation. He got tired of water logged food in his cooler—and was particularly grossed out once when packs of uncooked meat got wet and leaked all over everything else.